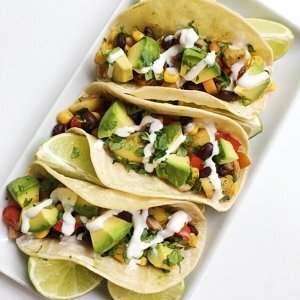 After a weekend of indulgent eating, it’s back to basics with these one-pan Veggie Bean Tacos. Carrots, mushrooms, squash, red pepper, black beans and corn all sautéed in a Mexican spice blend and topped with avocado, cilantro and a sour cream-lime drizzle. Packed with flavor and nutrients, this has been a go to meal of ours for years. We love that it can be made ahead and heated up and we love that the veggie bean mix works equally well with tacos, quesadillas or burritos. It is one of those meals that is highly adaptable too… you can substitute vegetables based on tastes and availability and use an already made taco seasoning or the spice blend blend below. This vegetable bean medley has been one of our go to meals for years... it's great in tacos (shown here) or in quesadillas or burritos. It is also highly versatile in that you can substitute vegetables depending on tastes or availability, and can be made with an already made taco seasoning or with the combination of seasonings below. No matter how you opt to make it, it makes a large quantity and is always a hit. Saute for 5 minutes or until just starting to get tender. Add squash, mushrooms, beans and corn if using. Let simmer on medium heat for 10-15 minutes, stirring periodically, until tender. (Veggie mix can be made ahead and warmed up when ready to eat). While veggies simmer, prep your toppings. Mix ½ cup sour cream & 1-2 tbsp of lime juice for sour cream drizzle. Warm corn tortillas in microwave or grill pan if desired. 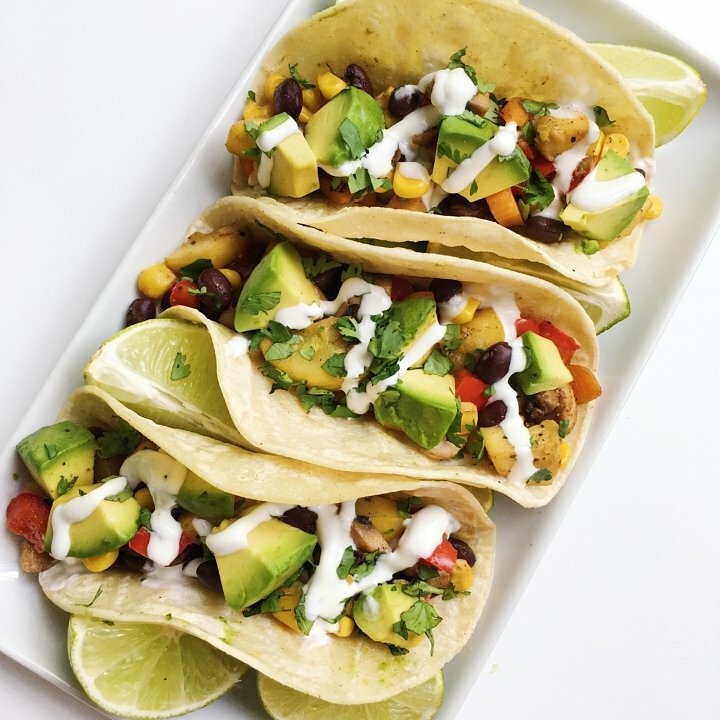 Put warm veggie bean mix in a corn tortilla, top with avocado, cilantro and sour cream drizzle. Feel free to add chicken for the meat lovers in your family.